November 2004 -- Recently television stations in Texas and Louisiana have run very positive coverage about a new nurse-run Texas operation called "Scripture Scrubs," which creates and sells scrubs covered with short quotations from the Bible (e.g. "Hope in the Lord, Psalm 146-5"). The coverage did not address whether such garments could be viewed as proselytizing by health care professionals, which could interfere with patients' rights to have their own spiritual beliefs taken into account and adversely affect care in a diverse society. We are also concerned that the association of nursing with certain religious imagery could reinforce stereotypes that nurses are loving and compassionate servants, rather than highly skilled professionals. (Texas) site (including video) is entitled "Divinely inspired medical attire." The piece, by Amy Hadley, includes quotes from Scripture Scrubs' creators. One describes the "movement in the health care industry to have a holistic approach to healing, which would include not only the physical healing but the spiritual healing. It comes at a wonderful time when nurses and doctors are much more in tune to wear and share and pray with patients." A similar story, the date of which we could not determine, is posted on Shreveport, Louisiana's KSLA-TV 12 site. This piece, which is unsigned, begins by asserting that "[m]any doctors agree faith is essential to healing," and notes that "[w]ith that in mind some ark-la-tex nurses are spreading a little spiritual TLC to their patients" through the scrubs. The piece reports that the scrubs' purpose is "spreading a little love to those going through a tough time," and then quotes a Scripture Scrubs nurse: "That's what nursing is all about, you know, sharing being a servant to your patients to show them compassion and understanding. It's the holistic approach to nursing because we go out there just not with [sic] nursing the physical but we also do the spiritual, the emotional, the mental." The Scripture Scrubs web site reveals that other messages on the group's scrubs include: "reside with the Lord," "one sows, another reaps," and "he who waters will be watered." Neither television piece displays awareness that anyone might see a problem with nurses in a pluralistic nation covering their professional attire with quotations from the predominant religion's central text. We appreciate the good intentions of these television stations and the creators of Scripture Scrubs. We also understand the role faith and spiritual support can play in patients' wellbeing. Of course, nursing is a holistic profession that focuses on the physical, mental and spiritual needs of patients. However, nurses also "take into account the needs and values of all persons in all professional relationships," and a "fundamental principle that underlies all nursing practice is respect for the inherent worth, dignity and human rights of every individual," as per the American Nurses Association Code of Ethics for Nurses (1.1). Similarly, the American Hospital Association "Patient Care Partnership" document acknowledges that patients may have "spiritual beliefs that are important to [their] well-being," and that these "will be taken into account as much as possible throughout [their] hospital stay." Thus, patient care encompasses taking account of the spiritual beliefs that patients already have, not promoting nurses' own spiritual beliefs to patients. We realize that many patients may share a nurse's strong belief in the Bible, and if a patient takes the initiative to establish that, that may be a different situation. But for other patients, having a health care professional wearing Biblical quotations, including ones with references to "the Lord," may actually detract from the psycho-social support that the creators of these scrubs seem to have in mind, especially for patients in a stressful and vulnerable situation. For instance, we feel confident that many residents of Texas and Louisiana, including some members of those states' growing Asian populations, are not devout Christians. Such patients may be reluctant to bring up their own spiritual needs with caregivers whose uniforms display Biblical quotations. It is true that many hospitals are associated with specific religions, but they do not typically admit patients or hire staff on that basis, nor do they usually inject religious doctrine directly into the professional relationships between nurses and patients. Patients who are not devout Christians deserve the same respect for and support of their spiritual beliefs in the caregiving process as those who are devout Christians. We can't help but wonder how the makers of Scripture Scrubs would feel if they were hospital patients in critical condition, and their nurses' scrubs were covered with quotations from the Koran. Even patients and family members who are devout Christians may express anger at God or doubt Him/Her at a time of critical illness. Such persons, struggling with deep issues in their own faith, may not appreciate receiving dozens of small text messages from their healthy caregiver advising them to "hope in the Lord." It is easy to imagine such messages sparking anger, or causing patients to suppress their real feelings. The television pieces might have explored whether the spiritual wellbeing of such patients could be adversely affected in such a situation. We understand that the Christian Medical & Dental Associations have "ethics statements" calling for "sharing our faith with our patients," apparently without regard to whether a patient really wants that or not. The promotion of a nurse's religion on his or her scrubs would be consistent with this view. However, the Center fears that such "sharing" could be viewed as a caregiver in a position of trust exercising undue influence to proselytize to vulnerable patients, which would appear to violate accepted codes of professional ethics and to pose a risk of harm to some patients, as explained above. We are also troubled by other aspects of the message these two television pieces send about nursing, including the idea that nursing involves "praying" with patients. Nursing was long associated with Christianity, and nurses today may of course be motivated by religious faith. But modern nursing is not a Christian vocation. It is a science-based profession in which nurses of different faiths provide life-saving care to patients of different faiths. Several parts of the pieces associate nursing with religious imagery (e.g., "spreading a little spiritual TLC," "sharing being a servant to your patients to show them compassion and understanding"). This last quote suggests that nurses act as "servants" of patients, an idea that seems to be echoed less explicitly in some of the scrub scriptures themselves, which focus on the value of service. 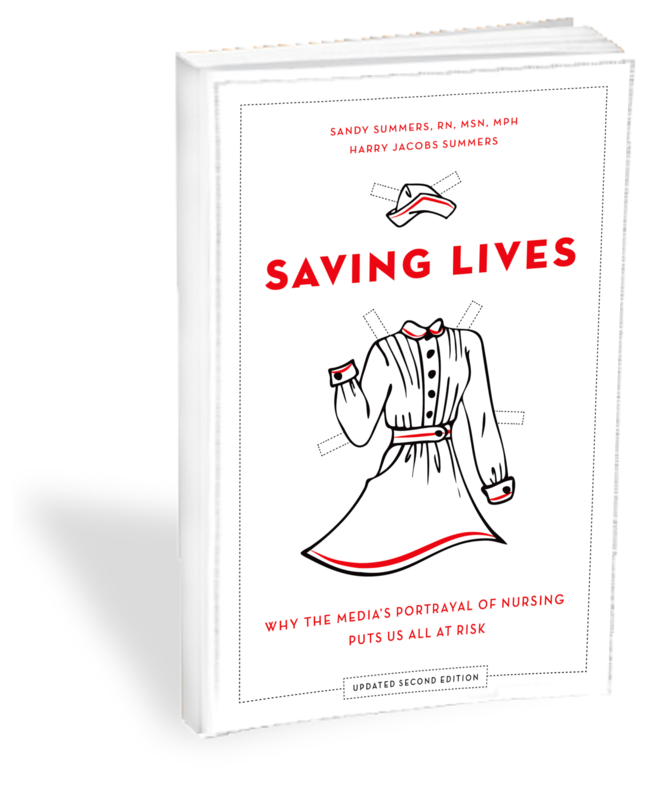 We understand that value, but we fear that given the persistent handmaiden stereotype of nursing, references to nurses as "servants" are not helpful to the profession. Moreover, to suggest that nursing is "all about" showing patients Christian "love" and "compassion" reinforces the old idea that nurses are angels, spiritually pure but largely unskilled. We feel sure this is not what the creators of Scripture Scrubs intended. Moreover, the KSLA piece's statement about what "doctors agree" implies that physicians are somehow driving the spiritual care that the piece describes, even though nurses are clearly the ones behind the products and are more likely to focus on such issues generally. Perhaps ironically, nurses have been leaders in the growing recognition of how cultural sensitivity and understanding by caregivers enhances health care outcomes. An early proponent of the importance of cultural awareness for health professionals was Madeleine M. Leininger, RN, PhD, FAAN, the renowned nursing theorist and leader who founded the Transcultural Nursing Society (TNS) and the Journal of Transcultural Nursing in 1974. The TNS works to improve health care to people of diverse cultures, and to promote "transcultural nursing policies, practices and leadership skills in education, administration and health care services." A basic theme in Dr. Leininger's work was that nurses should learn more about other cultures so that they can provide appropriate care within the context of that patient's culture. She also wrote the groundbreaking book Transcultural Nursing: Concepts, Theories, Research & Practice, among many others. Today, some nursing schools build entire courses around cultural awareness and Dr. Leininger's work (UNCO, St. Kate's, Breyer State, Rio Hondo). Culturally sensitive care is widely accepted and practiced within the nursing profession in the U.S. and other nations ("Culture & nursing care: a pocket guide"; "Pocket guide to cultural assessment; Contemporary Nurse; UK). Diversity Rx even has a Multicultural Health Best Practices Overview. Books on the topic include Caring for Patients From Different Cultures by Geri-Ann Galanti, PhD, and What Language Does Your Patient Hurt In? A Practical Guide to Culturally Competent Patient Care, From Other Cultures by Suzanne Salimbenes, PhD. A number of organizations work against the ethnocentric provision of health care, and to address the health disparities identified in the Institute of Medicine's 2002 publication, “Unequal Treatment: Confronting Racial and Ethnic Disparities in Health Care." These organizations include Transcultural Nursing and CulturedMed from SUNY Institute of Technology, which promotes culturally-competent healthcare for refugees and immigrants. We urge you to write to KSLA, news 8 Austin and to Barbara Payne, creator of Scripture Scrubs, at gideon@valliant.net and share your views on these important issues. Contact the Christian Medical & Dental Associations at: main@cmdahome.org. Thank you. Ethnomed from Harborview Medical Center has culturally specific health information. The Impact of Cultural Competence on Clinical Outcomes http://erc.msh.org/mainpage.cfm?file=7.1.0.htm&module=provider&language=English"
Healthy People 2010: Volumes I & II www.health.gov/healthypeople/Document/tableofcontents.htm#Volume2"